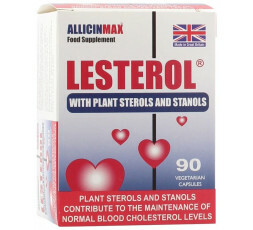 Lesterol helps to maintain a healthy cholesterol level. 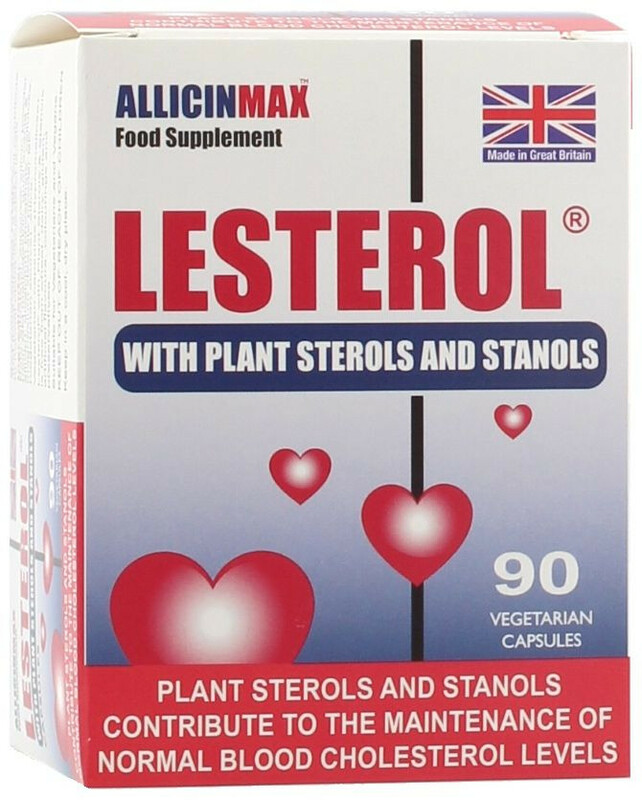 Lesterol also supports the natural immune system and helps maintain cardiovascular fitness. Beta-sitosterol is one of hundreds of plant-derived 'sterol' compounds (including sterols and sterolins) that have structural similarity to the cholesterol made in our bodies. The most prevalent phytosterols in the diet are Beta-sitosterol, compesterol and stigmasterol. Plant oils contain the highest concentration of phytosterols - so nuts and seeds contain fairly high levels and all fruits and vegetables generally contain some amount of phytosterols. Perhaps the best way to obtain Beta-sitosterol is to eat a diet rich in fruits, vegetables, nuts and seeds (which obviously brings numerous other benefits as well) or to take a daily dose of LESTEROL. Why Beta sitosterol and stabilised Allicin? Stabilised Allicin is a unique extract from fresh garlic and has a number of exciting properties. Only recently, decades after allicin was first identified in the laboratory, has it been possible to produce a stabilised form on a commercial scale. A team of chemists and chemical process engineers have pioneered and patented the unique process of water-based extraction and freeze drying that made this possible. This milestone achievement has finally made it possible for researchers to explore allicins potential more fully and more freely to confirm the most incredible spectrum of activity not only against a host of common ailments, including maintaining a healthy cholesterol level, but also against many of todays most pressing problems resistant bacteria, virus and fungal infections. Stabilised Allicin has also been proven to have a great deal of synergy with other natural extracts leading to an increased activity. Beta-sitosterol and stabilised Allicin also appear to modulate immune function, inflammation and pain levels through their effects on controlling the production of inflammatory cytokines. This modulation of cytokine production and activity may help control allergies and reduce prostate enlargement. In terms of cholesterol control, several human studies have shown that products containing a mixture of phytosterols including Beta-sitosterol, compesterol and stigmasterol, as found in LESTEROL consumed for 3-4 weeks, can reduce total and LDL cholesterol concentrations by about 20%. Doses used vary but the general acceptance is that approximately 300mg of sterol complex have been associated with a reduction in total and LDL cholesterol levels of about 5-15% in subjects with elevated cholesterol levels. Long-term safety studies have not been performed on Beta-sitosterol as a dietary supplement - but the compound is so widespread in the diet, that it is generally regarded as safe. No significant side effects or drug interactions have been reported in any of the studies investigating Beta-sitosterol or stabilised Allicin. Pharmacological testing of stabilised Allicin indicates that at least 750 capsules could be consumed all in one go and would still show no detrimental effects. Beta-sitosterol has good evidence of effectiveness in treating BPH and as a cholesterol-lowering supplement, again, the evidence for Beta-sitosterol is very good. Becker M, et al J Pediatrics, 1993. As an immune-enhancer, Allicin has much more evidence of effectiveness, but Beta-sitosterol appears to be quite beneficial in maintaining immune function during periods of heightened stress (such as exercise recovery). As a cancer-preventive agent, the animal and test-tube data for Beta-sitosterol and stabilised Allicin is certainly tantalizing, but preliminary, and needs further substantiation in humans. Dosage: For the first 10 days take 3 a day with food to build sufficient levels up in your body, there after take 1 a day with food.